Check out the Sargent Choice event calendar and joins us next week! Last week, Karen kindly opened her doors to the BU community for the last KJ SC Test Kitchen of the semester. 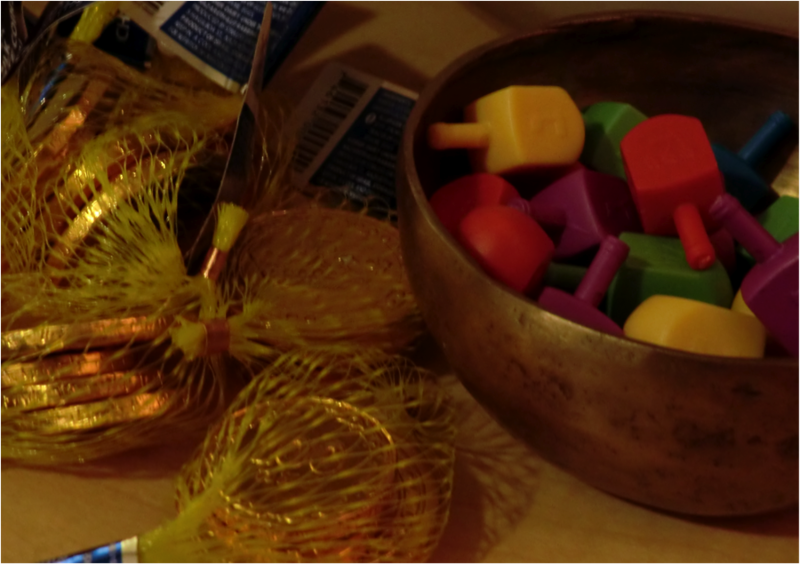 Karen held an early Hanukkah gathering fully-equipped with dreidels, gelt and everyone’s favorite, latkes! Karen revealed her grandmother’s latkes recipe, which called for 10 lbs of potatoes! Although the test kitchen was packed with students, 10 lbs of latkes was even too many for our hungry crowd of students. After making close to 40 latkes, it was already 11pm and time to close the test kitchen. Here’s a picture of all the potatoes we had left at the end of the night. The dietitians as the Sargent Choice Nutrition Center don’t want you to miss out on your favorite holiday foods but also want you to eat healthfully. This holiday season eat mindfully. Choose your absolute favorite holiday dishes and sweets and pass on your least favorite items. Filling half your plate with veggies or eating your side salad before your meal can also help you pace yourself before feasting over the holidays. Enjoy SC’s healthier recipe for potato latkes below this holiday season! 1. Combine grated sweet potatoes, onion, pepper, and eggs. Stir well to combine. 2. Add whole grain matzo meal or whole wheat flour and mix again. 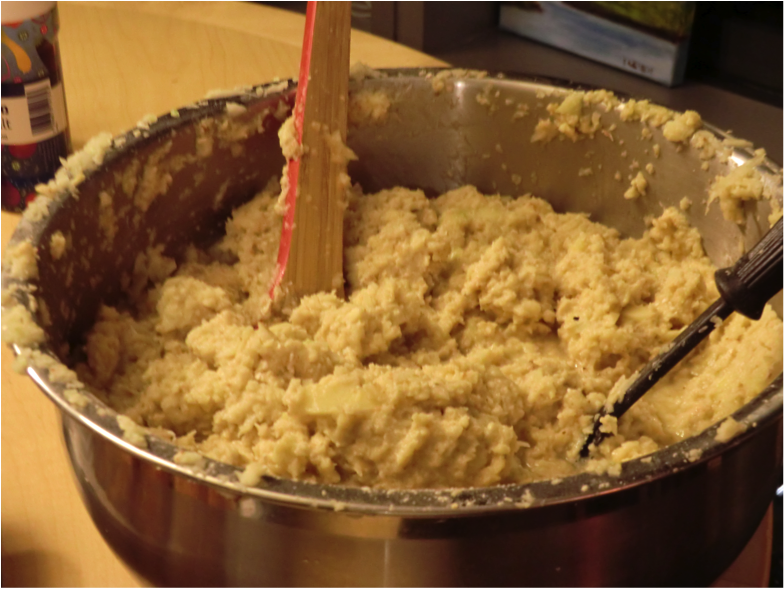 Note: Only add enough to make a batter; the mixture should not be too dry or stiff. 3. Heat half the light olive oil over medium-high heat in a large, heavy-bottomed skillet. Drop large spoonfuls of the batter into the skillet, pressing gently with a spatula to flatten each latke. 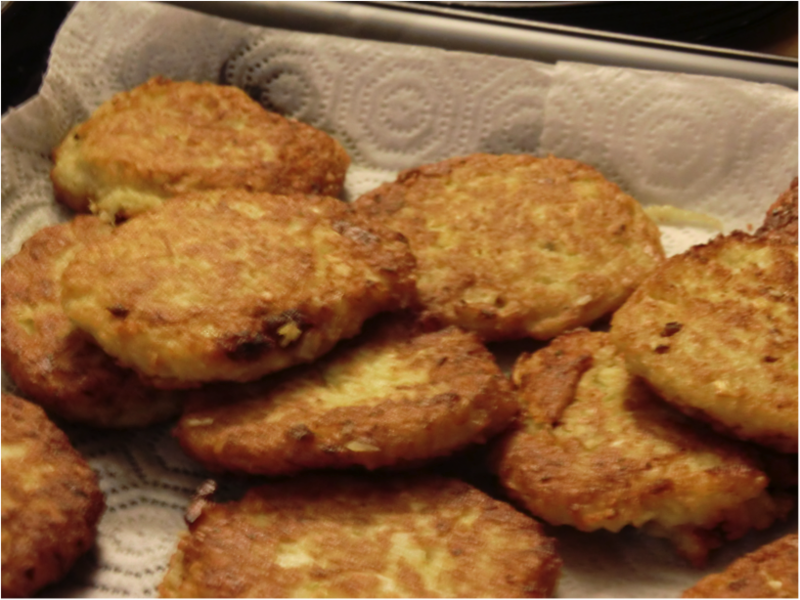 Each latke should be approximately ½ inches away from each other. Fry for 4 to 5minutes until the underside is brown, then flip and cook another 3 to 4 minutes more. 5. Serve immediately with applesauce.